I will definitely NOT make every single distance on betas the same. There has to be variance in the value of different outposts and in the strategies involved in taking and keeping them, otherwise the whole thing will reek of staleness. 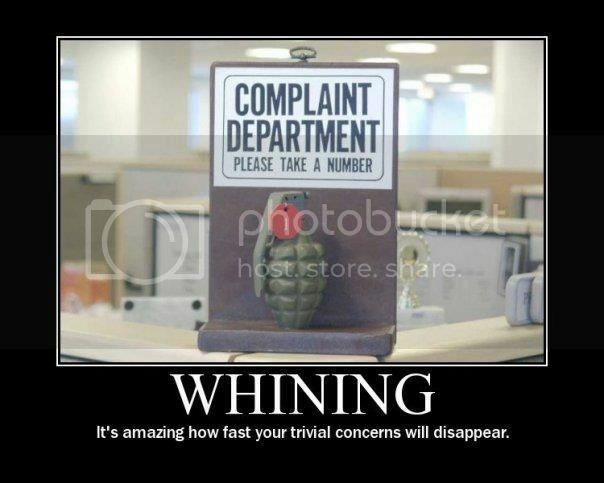 then do what ever the *** you want too and stop asking us for input. well, those outposts still have non-equal placed SAPs, terrain and such. btw, i want to thank you for considering connecting the beta TERMINAL with alpha. I agree with this, I always felt that Beta islands (and the game world itself) would benefit from less symmetry. 3. All of Beta being accessible from Alpha encourages risk-averse corporations that base out of Alpha and do pretty much only epi mining and PvP on Beta. 2. Then expand the design so some islands have a lot of connections and few outposts, some have a lot of outposts and few connections, doesn't matter as long as it's 100% not symmetrical - some real estate can be better then other! Total work for you = tweaking some teleport connections, spanking people like Anni and Ville for not terraforming, copy pasting and editing a few database values, and the game world drastically opens up. I don't like the idea, to be from alpha faster on gamma, than on beta2. Does anyone else feel like this is a ploy to allow people to run away? crying about more teleports and more ways into beta and gamma? I think the mindset of where the alpha gates and the relation to how close they are to gamma gates is unrealistic. You're making it too easy for people to be able to get on and off the island. I understand that you want multiple gates onto beta to keep people from jumping on few gates, however, if you take abbu into consideration there are 3 teleports that surround abbu which makes defense a nightmare. I like the fact that there are so many entries into beta. But, look at the placement of the alpha gates... they're everywhere. 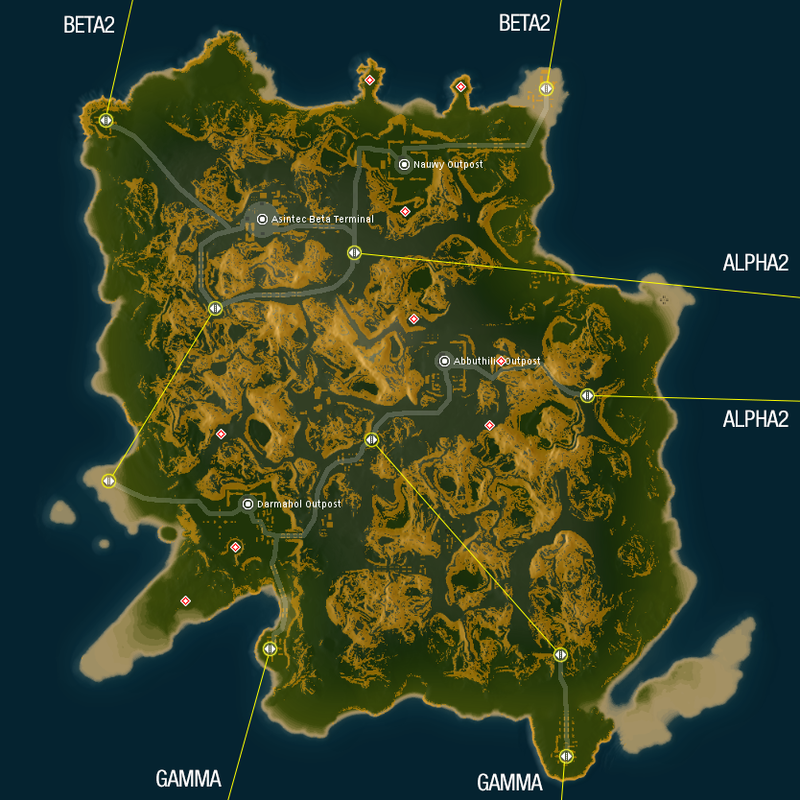 You can get to any part of the island from alpha. I think the alpha gates should be placed more towards the coastlines. If you want to do stuff on beta you should be forced to commit. My suggestions would be to place the teleports where Nawuy stands now, Gavastarc 2 and Teodoma. AS for teodoma gate maybe moved more towards the coast to the left. Like almost inbetween Darmahol 1 and Teodoma is now. The only thing you accomplish putting these teleports all over the place is allowing people to run back to alpha. So the question is do you want people to be able to gank and egress quickly? or you want an open beta where everyone just griefs everyone. Because that's where this is going to lead, people able to play alpha gate games with no risk while pestering people on beta. Well it seems like it's impossible to satisfy all the goals you have mentioned at once, but most of you seemed to have problems with the Alpha-Gamma distance. I feel like the outposts have similar potential this way, though maybe for different reasons (where the teleports come from, how many surround them, main terminal proximity). I'm now also more leaning towards indeed cutting Alpha2-Beta2 connections and having two 1to1 Alpha2-Beta1 connections with ample distance between them on Alpha2s. That could increase the value of Beta2 outposts. I agree with Zoom here, some variety is good. It looks good, especially the walk from Abbuthilia to Darmahol to the internal vs taking the mountain road to ASB nicely offers a lot of interesting choices to players and opportunity for other players to interrupt and create content. I like the trend of doing away with internal teleports and putting more emphasis on highways to generate most of the traffic on an island. I'm really excited at the prospect of Beta 2's being isolated from direct Alpha access, it offers a very interesting choice for corporation leaders and adds a lot of value (harder to reach) to Beta 2's. Currently for a corporation, it makes no sense to do anything but cram all your eggs into 1 station, but with the changes you are proposing regarding isolating Beta 2's from Alpha, I can definitely see potential benefit toward spreading things out. I like the potential (much later on) of Gamma islands being chained on to the Beta 2 islands, dividing up the routes into Gamma between Beta 1 and Beta 2, perhaps meeting down in the chain. I'll have to get some crayons out to accurately relate what I'm thinking. You're on a good road here Zoom, run with it. You can still do Alpha1 to Beta2 with interzones. But using waypoints as targets would be very OP and prone to getting stuck in holes and vegetation. New one looks better, still terrible but better. Whoever wants to scout their entrances will either drop enough probes or enough bots on gates. Once upon a time before probes, alliances paid people to sit alts on gates and keep watch while mining ops were ongoing and there were 6 entrances into Beta. POE used interzones extensively before to travel from one side of the world to another in ~5-10 minutes easy. Sparks are being removed for a reason, power projection is simply too strong and interzones are just another spark-teleport with a small delay. I'm in favor of making players walk the world, and commit to attacking or defending a territory. I'm tired of murdering a fleet on Alsbale then 30 seconds later I'm on Kentagura killing some poor Argano, then I'm back on Domhalarn chasing CHAOS, then I'm back on Norhoop killing Inda because his internet is terrible... It's just too much jumping around the game world. I dont understand this at all Zoom, its silly. Your removing sparks but making it just as easy to move. IMO all highways to Beta should be cut and Beta shouldn't have any highways at all, you need to increase the time it takes to get to a beta station from alpha not decrease it. I respectfully disagree, we don't need to increase walking times, we need to create risk and opportunity. And there is ample of those even with highways, not much so with spark teleporting. edit: I would even argue that highways and the promise of faster movement even lures more players there than now. The promise of faster travel with highways is certainly a step in the right direction, I feel the game needs to move away from instant teleports (spark and interzone alike) from and to Alpha safety, towards a more fluid travel system. They should remove teleports from and too pvp zones completely. Why would you risk mining any of the ABC materials on Beta if the travel time is very low? Making beta hard to get too and from increases the likelyhood that beta residents will use local resources and not alpha resources. It also decreases the risk for people doing that by making gank fleets easier to spot due to increased travel time, decreasing power projection and therefore localizing residents rather than making them be over two or three locations. This change would move further to make beta a place to visit and not live by making visiting easier and living more difficult. Thats what this change does. Makes living there more easier and more profitable then visiting from Alpha. Beta 2 being disconnected from Alpha promotes that even more. With new changes on the horizon for the game it is looking very sweet. Making beta hard to get too and from increases the likelyhood that beta residents will use local resources and not alpha resources. It also decreases the risk for people doing that by making gank fleets easier to spot due to increased travel time, decreasing power projection and therefore localizing residents rather than making them be over two or three locations. Making beta hard to get to and from indeed increases the likelyhood of people actually living there, however as I see it that's actually a problem currently. If you go that way, betas become a safe haven for the strongest player faction there, slowly boring themselves to death. Because if I as an outsider know that it's hard to get to, I don't even begin to try to get there. Remember when people started to miss casual beta roaming? but casual beta roaming happened BECAUSE people lived there. Until you get people mining and ratting on Beta you won't get roaming and its just sap warfare, the same status quo its been for years. What you need is the opportunity for everyone to live there, the incentive for them to do industry there and the illusion of safety while they are there. This change reduces the incentive to live there by making access to most of its resources easier and increases the risk by making it easier to move around the island for PvPers. Are Beta 2s still getting a terminal? I hope not, that was a bad idea. Maybe that was the case when we actually had players. Now the veterans outweigh all the casual people who might want to get a piece of the beta-cake and nothing will change if we just let the former bunch roll around on their own private betas neatly shut away from the world. And I believe once random missions roll out on betas with their beta bonuses, that'll be a nice incentive to have actual and frequent visitiors there, or food for PvP if looking at it from your perspective. B) station opening - that removes the barrier to ownership promoting residence. Your right that the changes will promote visitors but that's all it will promote. Ninja beta users and not residents.